These are heavy stationary base "chippping" vises. 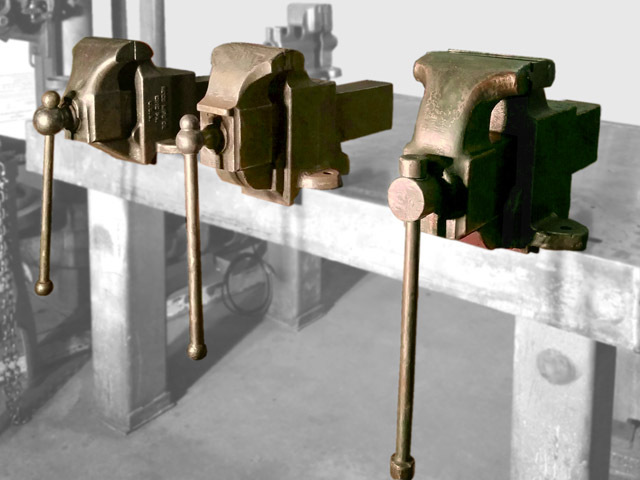 They were used largely for holding castings while Machinists hand chisled shapes they did not have machines to make. The process started with heavy chisling, then filing then hand scraping. Over time machine tools took over these jobs except for the initial clean up and grinders replaced chisling. Later they were used primarily for heavy fabrication, welding, bending. The three of these vises side by side show details of style rarely noticed otherwise. The Reed has a very modern upward flow to the movable jaw. The Prentiss includes many of the same details as centuries of English blacksmiths vises, a nice traditional touch. The Holland has a smooth form follows function look. I have two Prentiss vises, a 6" and an 8.5". I have not had a chance to use the bigger vise but the smaller is a dream vise for both metal and wood working.